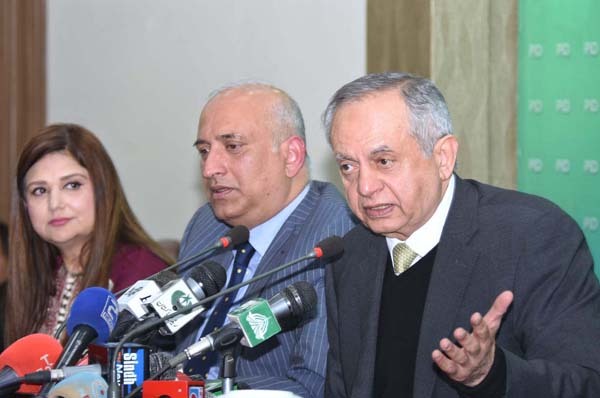 ISLAMABAD, Jan 30 (APP):Adviser to Prime Minister on Commerce, Textile, Industry and Production Abdul Razak Dawood on Wednesday said that government was rigorously working on improving ease of doing business to get the country included among top 50 economies during next five years. “Pakistan currently is ranked at 136 in ease of doing business and the government aims to bring it down to less than 100 in two years and among top 50 countries in next five years,” the advisor said while addressing a press conference along with Chairman Board of Investment Haroon Sharif. He said that ease of doing business was a major indicator for attracting foreign direct investment and for revival of industry. When the current government had assumed the office Pakistan was ranked at 147 in ease of doing business and due to several short-term measures, it improved to current 136th number. The adviser said besides ease of doing business in the country, the government was also working on simplifying the taxation system, visa regime and was taking steps to link all investment hubs of the country with one window facility. Speaking on the occasion, Chairman BoI Haroon Sharif said that South Asia was among the fastest growing economies of the world which was attracting the investors for investing in the region , adding that enhancing the foreign investment was on the top priorities of the government. He said that BoI, in close coordination with the provincial governments, was working to simplifying the taxation system as about 47 types of manual payments were involved to start any business, adding that one window facility was started by taking Federal Board of Revenue, Securities and Exchange Commission of Pakistan provincial governments on board. The system was streamlined and procedures were brought down to 16 from 47 by making all payments online, adding that the Pakistan embassies abroad were also asked to establish special visa desk to facilitate the investors. He further informed that government has also introduced one window facility for company registration was also introduced and Punjab Government was linked with the facility, adding that process for linking the Sindh has been started whereas all other provinces would be linked by March this year. In order to facilitate the investment, he said that the scope of one window facility was extended to property registration and a web portal was launched, adding that the procedures for accquring the other utilities including electricity, water and gas was also made online and are available on their websites. BOI head said that government was also working on 10 other indicators including cross board trade with China, Afghanistan and India for streamlining the matters related to trade and absorbing the increasing trade activities in ports. He said that for addressing the credit issues of exports, he said that the government had evolved a mechanism to pay back the returns. he said that one third of the refunds would be paid in cash whereas the for remaining amount, the government would launch promissory bonds to pay their refund claims. Haroon Sharif said in order to attract the foreign investment, dedicated business units would be established in each province to facilitate businessmen, besides making easy access to credit for fulfilling the financing requirements. He said that visa regime would also be improved for the businessmen and visa would be issued within 24 hours, adding that for further easing the visa process, online visa facility with four countries has already been started which would be extended to 60 other countries in next phase. He said that restricted movements was also abolished. BoI head said that prime minister’s visits abroad had brought about positive impact and perceptions of the foreign investors about Pakistan was changed and investors form Saudi Arabia, UAE, Malaysia and China had shown keen interest for investing in different sectors of the economy.